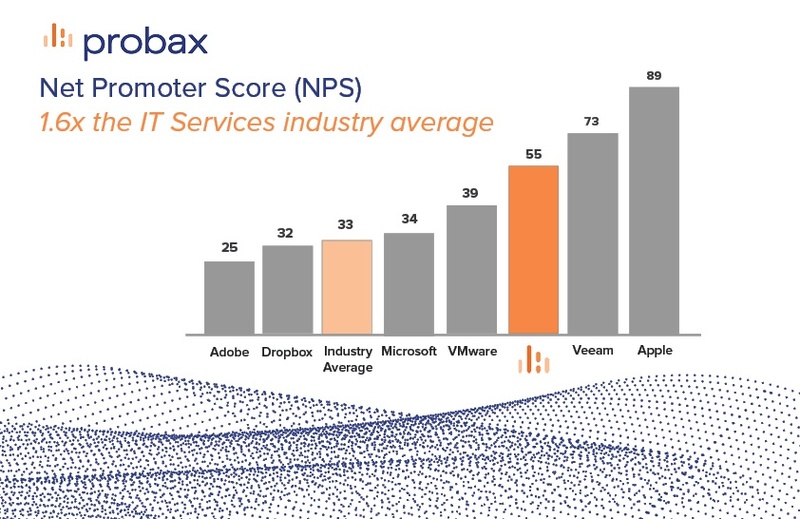 Probax are excited to share the inaugural results of their Net Promoter Score (NPS) research conducted by an independent third party shows the company achieved a rating of 55. This places Probax ahead some of the largest global brand names in their industry, and is 1.6 times the IT services industry average and 1.25 times the IT & software industry average. Net Promoter defines the NPS as measuring customer experience and predicts business growth. This proven metric transformed the business world and now provides the core measurement for customer experience management programs the world round. To create an even more detailed picture of how customers feel about Probax products and services, survey participants were questioned on a number of important metrics. Survey participants were asked a simple question: How likely is it that you would recommend Probax to a friend or colleague? Some of the Key Performance Indicators (KPIs) set for Probax in the 2017-18 Australian Financial year achieved a succession of 9.0+ scores, on a scale of 1 to 10. The results are strong, and they represent powerful feedback from customers across Australia and the United States. The Probax mission is to help its channel partners master the art of backup and business continuity. Over the last decade, Probax has evolved into a multi-vendor, multi-tenant Platform as a Service, offering intelligent and automated cloud solutions including Backup as a Service, Disaster Recovery as a Service, Archive as a Service, Software as a Service Protection and Veeam VCSP Licensing. Providing award-winning solutions to channel partners in Australia and USA, the Probax platform currently integrates with Veeam, StorageCraft, Dropbox, Microsoft and Amazon Web Services.